The Patriots always seem to have luck on their side, but preparation and hard work are on their side, too. PITTSBURGH — They say that luck is what happens when preparation meets opportunity. Others insist that luck is the residue of hard work and design. The New England Patriots are lucky. They are also fortunate and opportunistic, if not blessed. That’s been the case for so long now that when the rest of the National Football League sees the Pats win a thrilling game like they did at Heinz Field on Sunday, they simply shrug their shoulders, shake their heads and wonder when this dynasty will ever end. The Patriots’ latest huge win – the biggest in the NFL this season – came in dramatic fashion in front of a stunned sellout crowd of Pittsburgh Steelers fans. The home team had pinned the Pats to the ropes numerous times late in this game, but then made the dangerous mistake of giving Tom Brady one too many chances to fight back for a win. 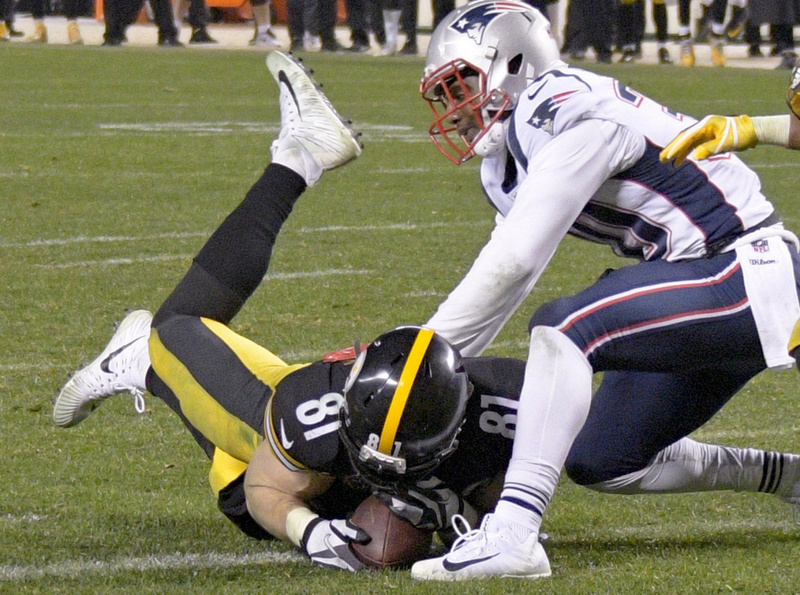 Throw in a bit of craziness in the final moments when a controversial call tilted Bill Belichick’s way and the Patriots shut the door on the Steelers to regain control of the AFC race with a 27-24 victory. That they did. The final chapter of this game was rewritten three times in the final minute. The ultimate touchdown, the official’s ruling and a freaky bounce all went the Patriots’ way. No one should be surprised. This is what has happened so many times in the Belichick/Brady Era. Endless Brady two-minute drives have ended in glory. Anyone need to be reminded about Malcolm Butler’s Super Bowl winning interception or Julian Edelman’s Super catch? Bottom line? When you repeat one miracle finish after another, season after season, year after year, it’s clear luck is indeed all about preparation and hard work. Why the Patriots’ brand of effort and planning is seemingly always sprinkled with pixie dust is a question only the football gods can answer. Things started falling for the ever-fortunate Patriots early on when another critical injury to a Steelers star fell into their laps. In last year’s AFC Championship Game, Le’Veon Bell aggravated a groin injury and left for the night after just six carries and 20 yards. The Patriots then throttled the Steelers and rolled to a 36-17 victory and a spot in the Super Bowl. This time around the Steelers lost Antonio Brown, the best receiver in football, to a calf injury four plays into the second quarter. Steeler fans chanted “MVP, MVP,” as Brown limped off the field but by the end of the evening, Brown’s MVP chances were officially toast. That’s because Brady would leave Pittsburghers with another painful memory of his mastery (11-2) in this matchup of AFC giants. There were some very big hiccups along the way, however. Late in the third quarter Brady threw an interception for the fourth straight game as Vince Williams stepped in front of a pass. It was Pittsburgh’s first pick of a Brady pass since 2005, a string of 300 tosses. It set up a Bell touchdown for a 24-16 Steelers lead that sent the Heinz Field crowd into hysterics. The Steelers still led 24-19 but picked an awful time to turn in their only three-and-out of the game and hand the ball over to Brady with 2:09 on the clock. On the first play of the drive an errant Brady throw was tipped at the line and somehow fell off Sean Davis’ arms. Then Tom Terrific went to work. Brady promptly hooked up with All-World tight end Rob Gronkowski three times for 69 yards to mow through the Steelers’ defense. Dion Lewis scored the go-ahead touchdown with 56 seconds on the clock. The final minute delivered more twists and turns than a Six Flags roller coaster. The speedy JuJu Smith-Schuster took a Ben Roethlisberger pass up the sideline and nearly to the house before being pulled down at the 10-yard line after a 69-yard gain. Then tight end Jesse James got free and crawled to the goal line with an apparent go-ahead touchdown reception that brought the house down. But then fate intervened. A closer look showed that while James crossed the goal line, he “failed to complete the process of the catch,” when he barely lost control of the football. When the teams regrouped, Roethlisberger connected on a short pass and then, with nine seconds left, fired a rocket into the end zone toward Eli Rogers. The Patriots’ Eric Rowe got a finger on the ball, it tipped into the air and Duron Harmon secured a stunning interception. Is that all luck? More like what happens when preparation meets opportunity and mixes with the splendid residue of hard work and design.